If you've just recently moved to the southwest, you're probably learning all sorts of new facts about how to landscape your home in this climate. It may come as a surprise to you that homeowners are actually able to have lawns in arid desert climates such as Tucson and Phoenix. What's even more surprising is that many people choose to have summer lawns and winter lawns, and each season requires a very different type of Tucson sod. Bermuda grass is the most common type of sod in Tucson in the summertime because it's a very tolerant species that can handle hot temperatures. The only issue is that Bermuda grass is dormant during the winter months, so if you want your lawn to be green all year then you have to plant a type of Tucson sod that grows in the winter, such as perennial ryegrass. It's best to plant Perennial ryegrass around October in Arizona because the climate is typically around 60 degrees which is ideal for this grass. Perennial ryegrass is a bunch-type grass best suited for use in full sun to moderately shaded lawns and is one of the fastest germinating grasses from seed. Once full grown, your ryegrass lawn will have excellent wear tolerance and can also tolerate some of the lowest mowing heights possible (1 to 2.5 inch recommended cutting height). When you plant rye grass in the winter it is called overseeding, because you are planting the seed over the existing Bermuda grass. Besides all the regular lawn maintenance steps of scalping, seeding, and fertilizing, a critical step in preparing your winter lawn is mulching. While it's an optional step for most lawns, you'll want to take the time to mulch if you do not have a good irrigation system or do not have a timer that can water 4-5 times per day. A well-composted mulch will help retain moisture and heat necessary to germinate your perennial ryegrass. 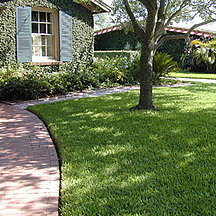 After you have spread the seed, spread the mulch 1/8" to 1/4" thick evenly over the whole lawn. 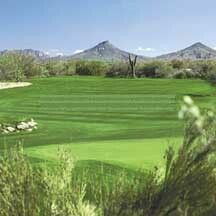 Ryegrass will start to die around May when temperatures in Phoenix and Tucson really start warming up. When it's time to transition your Tucson sod, stop watering your winter grass for a few weeks to let it die out. Then, begin your watering schedule once again to bring your dormant Bermuda summer grass back to life. Whether you are interested in over-seeding or other grass options, you are always welcome to visit our showroom. Come on in to meet our staff, get some great advice, and walk barefoot through our live grass sample areas. 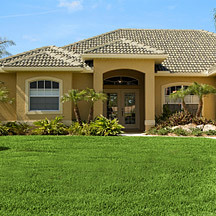 Evergreen Turf always has a green carpet rolled out for you! Select the perfect turf using our lawn selector. Once you've found the perfect type of grass, you can order online or by phone. Learn how to measure your lawn and how to install your new lawn with our helpful online guides. Enter your email address below and we'll remind you when it's time to reseed & change your irrigation schedule. You can remove yourself from our list at any time. Connect with us for more tips and information. 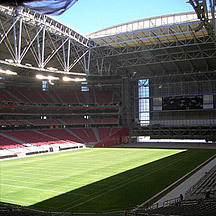 How to measure for Sod | Buy Arizona Sod Which Sod is right for you? QUESTIONS? Call 480.456.1199 or email info@evergreenturf.com. ©2019 Evergreen Turf. | Website design by Bohnsack Design.